This is what happens when you have a President that refuses to drill and refine our own resources and instead has a War on Oil. 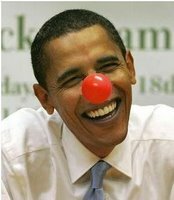 The Clown Prince, Barack Obama, The Comedian in Chief can joke all he wants on the campaign trial about Mitt Romney and the RNC Convention being on black & white TV. I think anyone in America would take the prices of gas in those good ole days and the GDP of that era as well. However President Obama, no one is laughing at the cost of gas at the pump. Barack Obama has set another record as President, the highest gas prices on Labor Day in history. Democrats arrived in Charlotte on Monday to an ill-timed reminder of one of the issues plaguing President Barack Obama’s reelection bid: high gasoline prices. Prices at the pump reached a national average of $3.83 Monday, according to AAA, setting a record high for a Labor Day. The previous Labor Day record of $3.69 was set in 2008, at the height of the last presidential election fight. President Obama Wants Higher Energy Prices … Obama wanted gas prices in the US the same as they were in Europe, $10/gal. Gas prices have increased by 23 cents in the past month during the height of the summer driving season. But AAA predicts that Obama, who has faced sustained attacks from Republicans over gas prices, will get a respite in the coming weeks once refineries that shut down as a result of Hurricane Isaac reopen. This President is just so funny. He gets up in front of his Kool-Aid, mind numb robots and asses around, cracking jokes as the American economy implodes, gas prices skyrocket and the National debt is about to hit $16,000,000,000. Yeah, a laugh riot you idiot. But of course Obama does not want to talk about the escalating gas prices, his blocking of the Keystone XL pipeline, and his war on oil. Imagine if America actually had an energy policy that really was an “all of the above” one, rather than Obama’s liberal inept and failed “green” energy agenda. 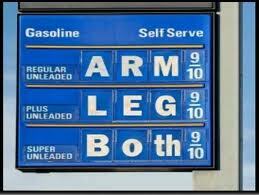 If we can close the DOE and the EPA so they cannot regulate energy producers to death, we could see gasoline below $2.00 per gallon. It isn’t just the refineries that were shut down during the storm that caused the price increases. The NE has depended on the Sun refinery complex at Markus Hook, Pa. since the 1930′s. This refinery is now going to be operated by another company and they were able to get some relief from regulations to reopen it. The regulations from the DOE and EPA have prevented anyone from building a new grass roots refinery for almost forty years. Environmental loons have scared the ignorant lawmakers in congress into passing legislation that prevents investors from building anything. The only way to change the gasoline sign is to remove Obama and all the Democrats from every government position. Then close the DOE and EPA to keep them from regulating energy production to death. We have plenty of oil and gas available to make this country completely independent of other sources in the world. The environmental loons have scared the ignorant lawmakers into passing legislation that prevents investors from building new refineries and drilling new fields. Not to mention the stupid cancellation of the tar sands pipeline from Canada. #2 – Yes, we should go back to the glory days when we had 2 oil men in the White House; The Bush Admin! Those prices were good for America, and we need to bring that back! $4.15 here in SO.CA. give or take a few cents. We have so much oil here and not allowed to drill.